- molars: upper molars have three roots (two vestibular and one oral), diamond-shaped crown; lower molars have two roots, square shape of crown. Adult human has 28-32 permanent teeth. Child has 20 milk teeth. Teeth are located in the mouth. External structure of the tooth. - Crown. Distinguish the anatomical and clinical crown. - The tip of the tooth. - Root sign (in vestibular norm the longitudinal axis of root deviates laterally). - dentin - determines the shape of the tooth. 72% of dentin - is an inorganic substance. Dentin consists of dentinal tubules, in which are processes of cells (odontoblasts). Odontoblasts located in the pulp. The structure of dentin consists of collagen fibers (tangentially located in the pulp dentin and radially in coat dentin), gluing substance. - enamel performs a protective function. 97% of enamel - is an inorganic substances. Enamel is composed of enamel prisms. - cement performs a protective function. Cement is divided into primary (acellular) and secondary (containing cells). Cement consists of collagen fibers and inorganic substances that make up 70% of cement. Cement has no blood vessels and feeds on by diffusion from the side of a periodontium. - pulp - is a loose connective tissue, rich in cells (pre-odontoblasts, odontoblasts, fibroblasts, fibrocytes), blood vessels, nerves; performs trophic function. 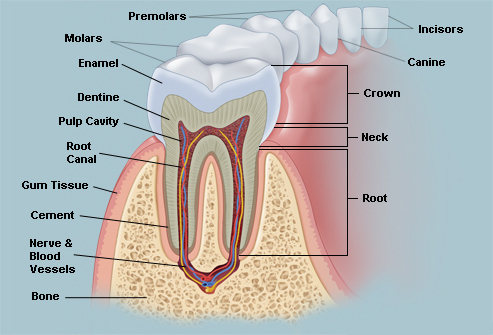 Enamel covers the crown of the tooth, cement - the root of the tooth, pulp contains in the cavity of the tooth. - Cambial function - performs due to the presence of periodontal osteoblasts, osteoclasts, cementoblasts. Tooth alveolus includes periosteum of the alveolar process and bone wall of dental alveolus.